Yes, the title of this week’s post is a mouthful, but it is the official name of the entire system at the G-CANS site, rather the Ryukyukan museum which is just a small room and tour of the system at the discharge centre. I’ll either mention the entire system as the underground discharge channel, or the G-CANS system from here on out. The system is pretty extensive taking 27 years to bore 6.3 km of tunnel and digging out 5 huge water silos on top of building a pressure-adjusting water tank and pump system. The entire system is situated about 37 km north of Tokyo, rather Nihonbashi as all roads lead to Nihonbashi in Tokyo. 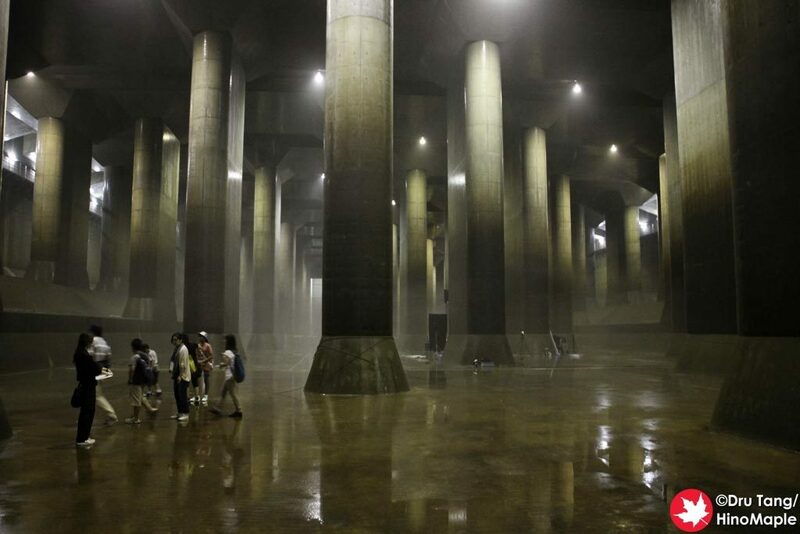 The underground discharge channel protects the Naka and Ayase river basin. Note that the Naka and Ayase river basin is actually a single basin, and not two. The Naka and Ayase river basin is roughly 60 km long from Tokyo Bay to Saitama. In the north, it is bounded by Tone River as it straddles the border of Gunma and Saitama. In the east, it is bounded by the Edogawa which starts as a branch from the Tone River near Ibaraki and out at Tokyo Bay. On the west, it is bounded by the Arakawa for the northern and southern sections, and the Ayase River in the middle. In 1955, an area 20-40 km from Tokyo Bay and within the Naka Ayase basin was only 5% urbanized, but by 2010, it was over 50% urbanized. The entire Naka Ayase basin was prone to flooding and building the underground discharge system was a major factor in protecting all of these homes downstream. The first part of the entire system is the underground “river” as they say. It is a tunnel that is 10 metres in diameter that runs from the Otoshifurutone River to the Edogawa for 6.3 km. The tunnel was bored out at a depth of 50 metres underground and runs under highway 16 in Saitama. The second part of the system is the water banks, or water silos, or water shafts. Depending on how you want to look at it, all three of these terms are suitable and even the Ryukyukan museum can’t decide on one specific terminology for this portion of the system. These tanks vary in size with the 3 major silos being 30 metres in diameter, and slightly conical with the lower base being narrower than the top. The two smaller silos are approximately 22 and 15 metres in diameter respectively. All of the silos are roughly 70 metres deep. To give some perspective, the Statue of Liberty is 46 metres tall; the pagoda at Sensoji is 53 metres tall; and the space shuttle with its booster rockets is 56 metres tall. Each of these can fit into the larger silos, although the space shuttle’s wings wouldn’t fit. They are a few metres too wide, but I’m sure they can easily make the silos a little wider if their intention was to put them inside each one. 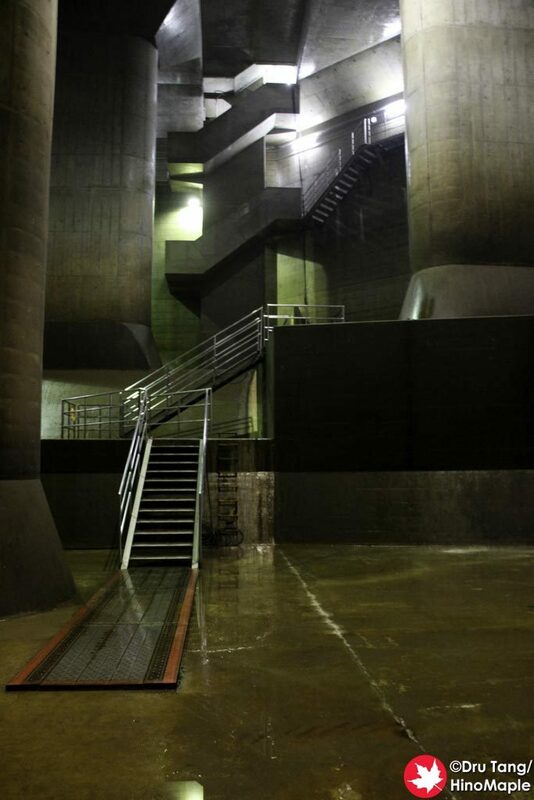 The main purpose of each silo is to moderate the flow of water within the tunnels. Without the silos, the water would just shoot out of the end into the Edogawa, and probably deep into Chiba. The silos themselves are not just simple holes in the ground. They proclaimed that the silos were designed to take in water in a vortex method. The water comes rushing into the silos along the walls where it swirls to the bottom helping improve the speed at which water can be taken in as well as reduce the impact of the water at the bottom of the silo. From their explanation, I thought it was implemented in all of the silos, but it was only implemented in 2 of the silos, as per their information, but I figure I just didn’t understand them as clearly in Japanese. The silos also have a secondary use as they are used as access points to the main tunnel. In order to do maintenance on the tunnels, they need to bring in trucks, and the best way to do that is to open up the tops of the silos and lower the trucks by crane. I wish I was able to look down into the silo itself, but due to safety reasons, I wasn’t; not even from on top where a safety grate is located. The pressure-adjusting water tank is the crown jewel of the entire system. It is what most people want to see, and what you’ll see in most pictures of the Ryukyukan tour. It is the main highlight but there is just so much information that it is difficult to talk about everything. The water tank is connected to the first water silo via a huge opening. The tank itself is 177 metres long, 78 metres wide, and 18-22 metres deep. The water tank can be filled up to 18 metres high, but I suspect that the true height is closer to 22 as they have a special platform around the entire tank and there are access panels to the ground level. There are 59 pillars inside the tank which, as the brochure states, makes it a “shrine-like gigantic underground space”. Simply put, it is majestic looking, but it really has no life in it. It can be reminiscent of going to a gothic church, only scarier. The pillars themselves are 7 metres long, 2 metres wide and 18 metres tall with a weight of 500 tonnes. Try lifting that by yourself and you are likely to get a hernia. The water tank itself is so popular that it has been used in various movies and music videos, as well as car commercials. On the silo end, there is a special series of access panels that let in a little bit of light. These panels are opened up from time to time to help lower trucks to help clean the water tank. All of the water that enters the tank is from the nearby rivers; and all of that water has a lot of sediment within it. Once the tanks are emptied, they need to do maintenance, mainly cleaning the floors. The most efficient way to do this in such a large facility is to just lower a truck in and clean it up as if it was a road. I’m sure I’m simplifying the process to some extent but it does sound better this way. If you ever do enter the water tank, a very interesting effect is the mist that you see inside. On my trip to the water tank, the floor was still very wet and the water had created a mist cloud in the bottom two-thirds of the tank. It was fun to see and hopefully you’d also be able to see such an effect if you did visit. Lastly, yet not least, is the discharge system. We were not able to go all the way to the discharge section of the water tank, so we couldn’t see things up close, but we were told about the system itself. There are 4 pumps powered by modified aircraft jet turbines. 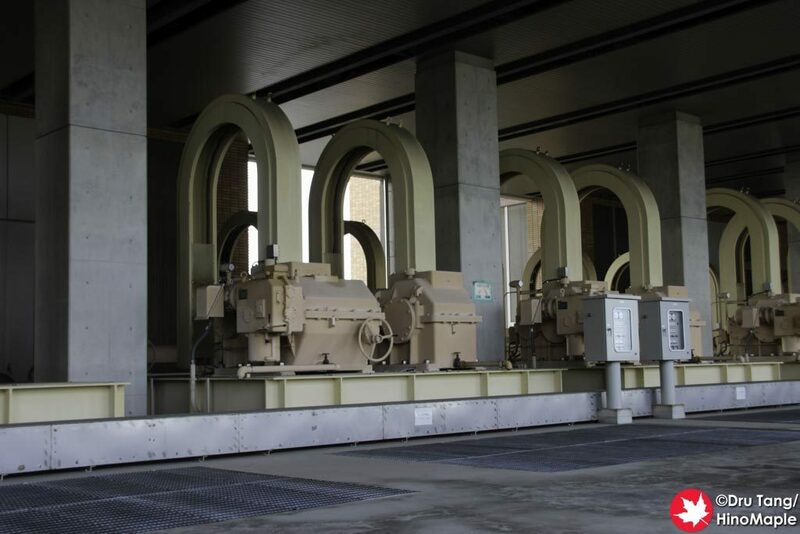 These turbines work together to turn a water screw that pumps the water out of the water tank and into the Edogawa. I couldn’t tell if they had 4 water screws or just one, but I would suspect that it was 4. The entire Ryukyukan itself was built on top of the pump system, so you can imagine how large it is. Once the water is pumped out of the tank, it needs a place to be discharged; that place is the Edogawa. 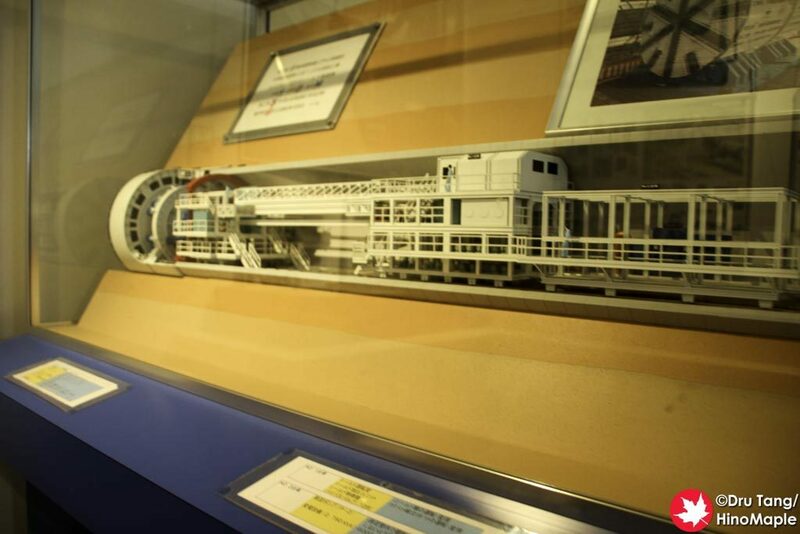 From the water pumps to the Edogawa, there are 6 drainage sluiceway tunnels. Each of these sluices is larger than the cross section of a typical JR train. When running at full capacity, the water pumps can pump out 200 cubic metres of liquid a second. The most famous stat the facility likes to promote is that 200 cubic metres is actually the amount of water required to fill a 25 metre swimming pool. Just one small problem as an Olympic size swimming pool is 50 metres and they don’t mention how many lanes it would have to be. Assuming a Japan standard 25 metre length pool and the standard lanes are 2 metres wide and 2 metres deep; that would be 100 cubic metres per lane so it would be a simple 2 lane pool. If we are being kind and using the minimum depth of 1 metre, then we can expand it to 4 lanes. Still not that big if you ask me, but then again I’m comparing it to an Olympic sized pool which is 2,500 cubic metres in volume. If the discharge system could pump an Olympic sized pool amount of water, I would truly be impressed. While this post has a lot of numbers in it, the underground discharge channel is integral in protecting Tokyo from floods. Since the underground discharge system was completed, the area of flooding in the Naka Ayase Basin has reduced dramatically. G-CANS was designed to handle huge storms that come roughly every 10 years or so, but I’m sure it can handle a lot more. 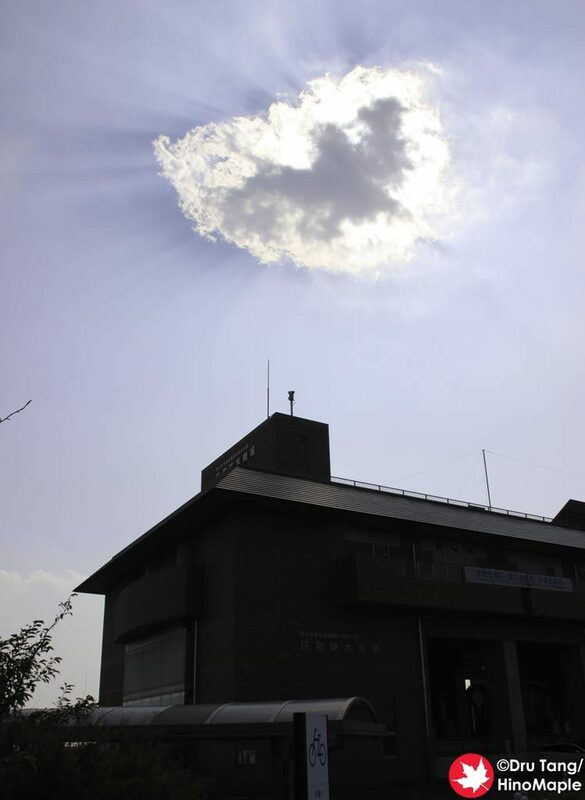 It is an important part in protecting Tokyo from various natural disasters. For a system that cost roughly the same price as the Mori Tower in Roppongi, I’d say it was worth every yen. When you consider roughly 137 hectares of land was flooded in July 2000 due to 160 mm of rainfall and only 33 hectares was flooded in December 2006 with 172 mm of rainfall, I’d say the system has worked very well. Due to the costs of the system, it is important for the regional governments to promote the system and show how well it has been working. It has also given me and countless others the valuable opportunity to see something unique. When Japan decides to do something right, they always do it right. The Metropolitan Area Outer Underground Discharge Channel is part of a series of posts on the Metropolitan Area Outer Underground Discharge Channel. Follow the links below for more information on this system. Here is a map of the G-CANS system, minus several silos as I couldn’t find them on the map. If you know where they are, please let me know and I’ll add it to the map. This entry was posted in Kanto and tagged Ara River, Arakawa, Arakawa River, Ayase River, Edo River, Edogawa, Edogawa River, Flood, flood control, G-CANS, GCANS, japan, Metropolitan Area Outer Underground Discharge Channel, Naka and Ayase Basin, Naka and Ayase River Basin, Naka Ayase Basin, Naka Ayase River Basin, Naka River, Otoshifurutone River, Pressure Adjusting Water Tank, Ryu Kyu Kan, Ryu Q Kan, Ryukyukan, RyuQkan, Saitama, sluiceway, tokyo, Tokyo Bay, Tone River, water shaft, water silo, water tank by Dru. Bookmark the permalink. This is a great post. I’ve got to get myself over there. Soon. Yup. I’m sure you’d love it. I doubt they were originally used in jet aircraft, but I am pretty sure they were originally designed for it. Can we get the G-CANS management team to take over at Fukushima? Please?! It’s a completely different beast, but yes, they could probably do a better job at it.